If you are engaged in Internet marketing and want to learn more about the industry, you may have heard of the website called Inbound.Org. Inbound.Org is a great social news website entirely dedicated to everything related to online marketing. Basically, that is a community-based news platform, where members can submit the most interesting and up-to-date industry news and decide which one really matters. The website was launched a couple of years ago but quickly won popularity with both seasoned and new internet marketers. However, if you surf the Web, you may come across different opinions about the community. The point is that Inbound.Org is a unique platform that has a strict set of rules not everyone is aware about. That resulted in multiple TOS violations and was the main reason why lots of beginning marketers burnt their fingers when contributing to the community. This post will explain how to avoid any pitfalls when using Inbound.Org, and teach you what to do to get most out of the website. build your authority in the community and enlarge your social following. The only requirement to join Inbound.Org is to have a Twitter account. Once you get logged in, you can access your social profile. To do that, hit the corresponding button in the upper right part of the window. Note that filling in an Inbound.Org profile is truly important! The main reason why this step can't be skipped is that without providing your personal info, you won't be able to build your authority in this community. Say, your content becomes popular and some regulars start checking out your profile. When they scan your info, they may proceed to your site or blog, Twitter page or Facebook profile. Thus, they will know who you are, trust more to what you say and may even link to you. 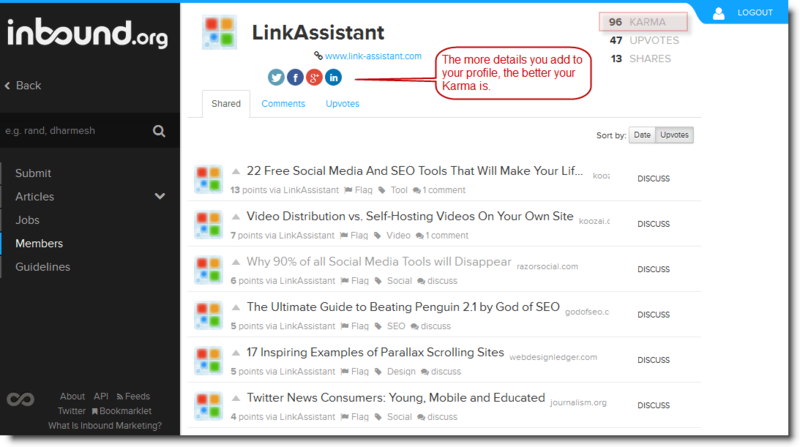 Besides, the more details you provide about yourself, your website, business, company, location, etc., the more karma points you will receive on Inbound.Org. As a result, you upvotes will get more 'weight'. NB! Please also note that if you need to edit your Inbound.Org profile in the future, you will have to create a free user account on HubSpot. The website's interface is quite intuitive and easy-to-understand. Once you login, you get to the community's front page. Here you can view the most popular submissions (the hottest topics) and the ones that are quickly gaining popularity (the newst articles that have received lots of upvotes right after they were submitted). You can upvote each submission, leave a comment on it or (in case you find it inappropriate) flag it. Useful Tip: Now, if you need to send a link to a particular Inbound.Org submission, you need to click on the Discuss button. Thus you will open that submission in the new window so you will be able to copy the link. If you want to check only the freshest submissions, jump to the Incoming tab. 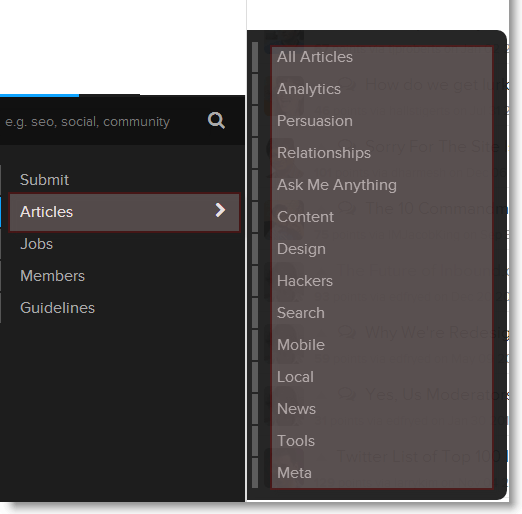 To read the most voted and discussed articles, switch to the All Time tab. Also, you can view article on a particular topic only. Currently there are 15 thematic categories the submitted articles/discussions get into. 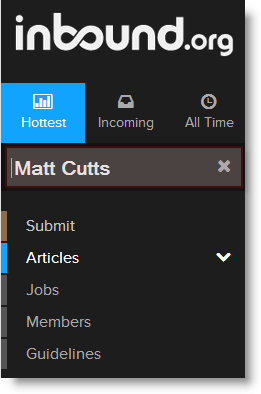 To sort all submissions by the category, you need to click on the arrow next to the Articles button. And if you are looking for articles on something specific, you can use the search form. Just enter your keywords into the search field and hit the Enter button. Besides submitted articles and discussions, Inbound.Org has a section where you can find great job opportunities. The section is dedicated explicitly to posting jobs available in the online marketing world. It has very interesting job listings (mainly for the U.S.), so that can serve as a great resource for ambitious content marketers, SEOs, SMMs and other internet marketing specialists. Here you can find more useful tips on how to get hired as an online marketer. AMA is a discussion-thread session where an interviewee (a featured expert) answers questions posed by the community for one day. Questions may be about anything related to internet marketing and his/her expertise. The idea came from Reddit and first was tried out in the Inbound.Org community about a year ago. It worked out well, and now there is a whole dedicated AMA category on the site. Another value of this section is that it can provide food for thought to all bloggers writing about SEO, content marketing and such. Here they can find the most up-to-date topics for their blog posts. How to Manage Content on Inbound.Org in 3 easy steps? This is perhaps the most important part of the post. As you know, Inbound.Org is all about collecting the best online marketing content and deciding as a group which one of them if the most important. Can I submit my content? The platform is originally designed for spreading the very best industry news and ideas for online marketers. Submitting one's own content is also allowed, providing it is may bring some value to the community members. But according to Inbound.Org Guidelines the fair submissions ratio should be 1/10. However, you should be careful with submitting your own stuff! Say, you submit 9 low-quality articles (that get NO upvotes at all) and one high-quality post of your own. Inbound.Org moderators will manually check each submission and easily detect this manipulation. Next your article may get deleted and you may receive a 'yellow card'. After the 2d 'yellow cards' you are out. Step 1: conduct little research every time before you make a submission. Hundreds of submissions are made on Inbound.Org every day. Of course only very few become popular with the community members and get promoted to the front page. In order to make a really worthy submission, you need to be in the know of the latest industry trends. Also, you should understand what information the community currently needs, and what are the hottest topics there at the moment. Only in this case you will be able to say what will work here and what will not. So, you need to listen to what Inbound.Org members are talking about, study their interests, find out what is currently bothering them, etc. Thus you will better understand the community and its people. Step 2: create a killer title. A long list of different titles is the first thing people see on Inbound.Org. Depending on whether a title appeals to them or not, they may either click on the link or ignore it and scroll down. Titles should be maximally informative and catch one's eye. If a title of your submission doesn't look convincing enough, you can edit it when committing the submission. Step 3: Spark a discussion in comments to heat up interest to the topic. The most discussed topics always drag more attention. 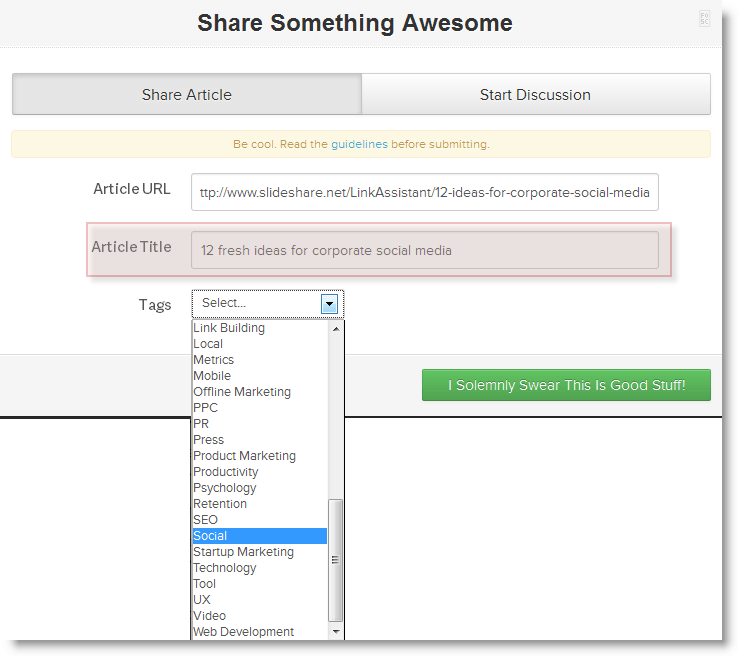 When submitting an article to Inbound.Org, you can supplement it with a comment. In the comment you can either agree or disagree with what your submission describes, add your own vision of the problem, describe your experience of dealing with that, etc. This will arouse additional interest to the submission, readers may engage in conversation with you, and the submitted article will get more exposure. On a side note: as we said before, you need to fill in your personal profile and download your profile picture. Thus, if you continuously submit interesting and useful posts, the community members will start identifying you by your avatar, and your new submissions will get more clicks. The system of voting for the submitted articles and discussions is pretty easy. All you need to do is just to hit the Up Arrow button next to the submission. What the number of points I'm given to upvote depends on? You may have noticed that the number of points you may get from different community members may vary. Some upvotes bring 5 points to your Karma, and others just 1.
and one's personal profile (the more details one provides about themselves, the more points each their upvote can bring). Same rules apply to upvotes you give to others' submissions. How to Avoid any Bans and Penalties on Inbound.Org? As I said before, the community is known for its strict content submission guidelines. After two violations of the community's rules users get permanently banned! 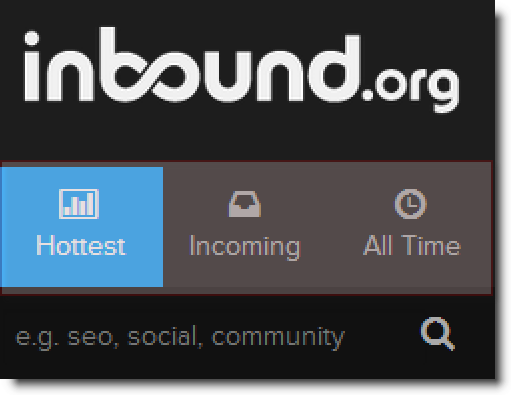 Inbound.Org is perhaps the best learning platform for Internet marketers. This is the place where the most brilliant minds of the industry share their experience and provide valuable advice and guidance. Here you can not only find high-utility articles and discussions of the latest industry trends. Also, this website lets you discover lots of valuable educational posts that you might have missed reading before. The process of education on this site is double-sided. 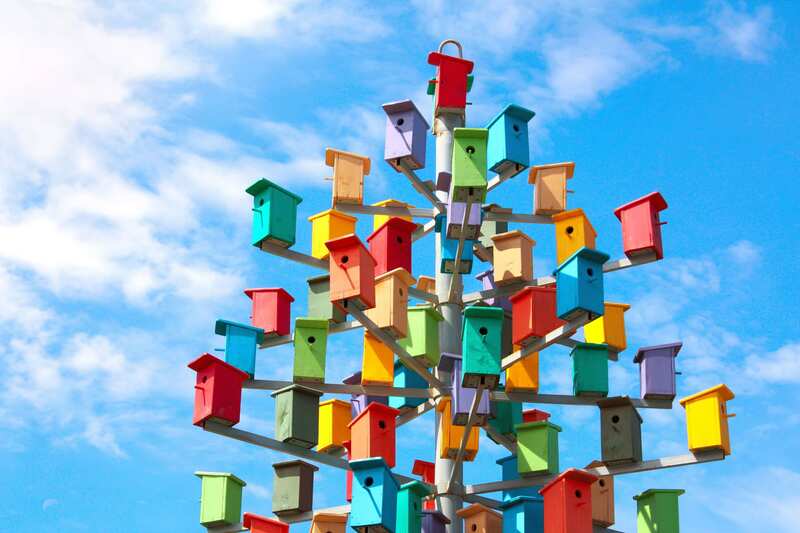 If you discover a post about little-know SEO tricks or bump into some interesting Internet marketing news, you can share it with the community and earn more respect and authority there. Before you start using the website, decide what you actually want to achieve with its help. Is it earning fame as the industry influencer? Is that learning the basics of online marketing trade? Or perhaps it is becoming the industry influencer and drawing attention to your content indirectly? Depending on your goals, you can shape an effective plan on how to use the community and get most out of this social news platform. Specialized social news platforms are getting more influence as a key channel to reach the right audience in almost every communication strategy. a ready-made list of top players to connect on Twitter, Google+, etc..
P.S. Have you ever used the website before? What was your experience like? Do you have more ideas on how to get more value from the community? Share your thoughts on using this social media news platform. Your comments are greatly appreciated. Photo Credit:jef via Flickr cc. Egg Hunt’s Round the Corner – Win Internet Marketing Prizes Worth $5000!